Oscar learned how to wave! Wave is one of my favorite mini pig tricks so far because there are few things cuter than a waving mini pig. This was a fun trick to teach Oscar because it’s a really easy, comfortable motion for him. Other tricks, like sit and jump, are less natural and are harder for him to perform, but Oscar seems to really enjoy waving for treats. The mini pig training for wave builds on shake. If your mini pig hasn’t learned to shake, I highly recommend starting there and then working up to wave. Once your mini pig knows how to shake, learning how to wave is pretty easy since the motions for shake and wave are almost exactly the same for the pig. Here is the training video with instructions on how to teach your mini pig to wave. Once your pig knows how to shake, you need to make two changes to train your pig to wave. First, when your pig raises her hoof in the air, you no longer tap her hoof as you did when training shake. You want your pig to raise her hoof on her own and just swipe it in the air instead of meeting your hand on the way down to shake. Second, you need to switch the command word since we still want the pig to know how to shake. So, start by saying “shake” but, when your pig has her hoof in the air to shake, say “wave” to switch the command. Eventually, you can take the word “shake” out completely and just say “wave” to instruct your pig to raise her hoof. This can sound a little confusing in text, but it’s really pretty simple and is more thoroughly explained in the training video above. 1. Ask your pig to shake. Say “shake” to get your pig to raise his hoof in the air. Go ahead and raise your hand like you are going to shake, but don’t touch your hand to your pig’s hoof like you would with shake. 2. When your pig’s hoof is raised in the air to shake, say “wave” and then click and give your pig a treat. 3. Ask your pig to shake again. You can again raise your hand as if you’re going to shake but don’t touch your pig’s hoof. As you continue the training, you should be able to start taking your hand out of the trick completely. So, go ahead and raise your hand if it helps your pig start the shake/wave motion, but you want to start decreasing your hand motion each time. 4. Again, when your pig’s hoof is raised in the air to shake, say “wave” and then click and give your pig a treat. 5. Once your pig has that down, you should be able to take out the “shake” command and your hand motions completely. 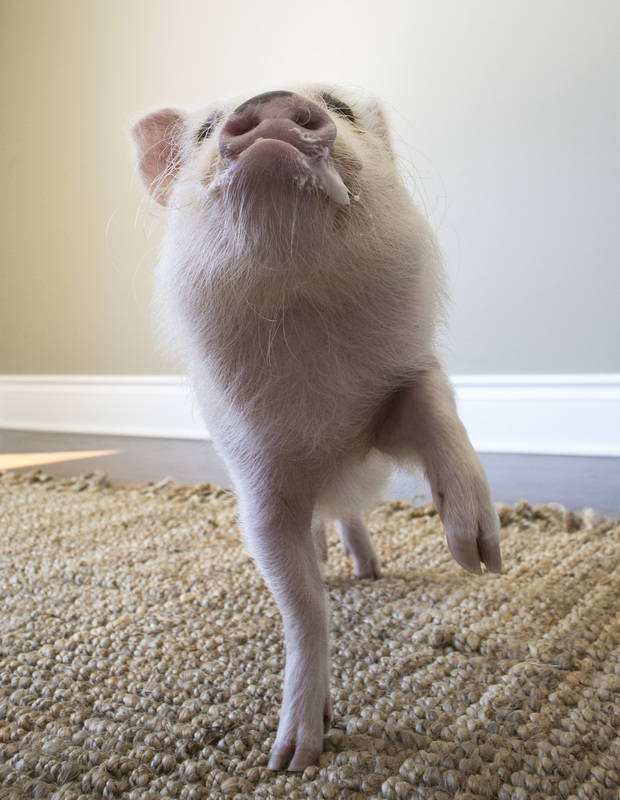 Say “wave” and then click and give a treat when your pig raises his hoof up to wave. Once your pig has both shake and wave training down, mix both tricks in with others like circle and kneel to make sure she’s really listening to each command. Oscar often performs his most recent trick repeatedly to get treats, so I like to mix all of his tricks up to make sure he’s really paying attention to the commands. If this is your first time training your mini pig, I recommend starting with circle in order to get the mini pig training basics down and then build up to more challenging tricks. If you want to know more about clicker training and why I use the clicker, check out our mini pig training basics video. Previous PostMini Pig Oscar Celebrates His First Easter with OatmealNext PostMini Pig Oscar’s First Birthday Party! When Elmer shakes his hoof, he nods his head at the same time. Not sure why as I never taught him that, but it’s funny. He’ll do anything for his favorite treat….dates! Oscar is so calm around treats. Was he ever crazy around food/treats? My Weston is crazy and can’t contain him self around food. He is feed a well balance diet and grazes outside everyday so I know it’s not hunger. He is 5 months old maybe hes an excited baby and will grow older and calm down. We never feed from our hands. We drop treats on the ground and only give treats when he does a trick. But if you move your empty hand he’s up from a dead sleep chasing your hand. Not sure how to correct this. It’s really bad with guests. Any advise? Lol Weston runs to the kitchen too from a dead sleep. Thanks so much for advice I will try!! !